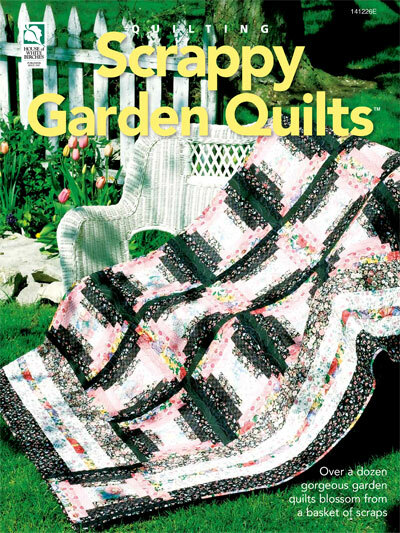 Whether or not you have a green thumb, you can create a garden of quilts with this charming collection! Each of the dozen garden-inspired designs is made with colorful scraps, so the end result is a delightful rainbow of color. Rose of My Heart features Bali prints and a pretty heart-shaped flower pattern. Flowers in Bloom is made with simple circles cut from vintage or reproduction prints. Blooming Cabins is irresistible with luscious colors arranged in a Courthouse Steps pattern. Home in the Garden is an adorable little wall quilt that is the perfect showcase for vintage scraps and old buttons. Make all these quilts and more, and you'll grow a beautiful garden for your home using a variety of techniques including piecing, strip piecing, applique, bias strips, 3-D flowers and more.